Next week going to be last week of rest and to be treated like a princess...so better enjoy it while I can. I am kind of pretty occupied with meeting, workshop and teaching for the next following week, but I learn to take it easy this time. I had a never ending projects one to another before, but it was stated that I must take a break because of my circumstances. God knows how I am overly worried when I am laying down dealing with pain, but somehow schedules and programs fall in place accordingly. I apologize there are no more seat available for my Book Binding Workshop at the Lollipop House this coming 14 April. I had planned ahead for my next workshop. 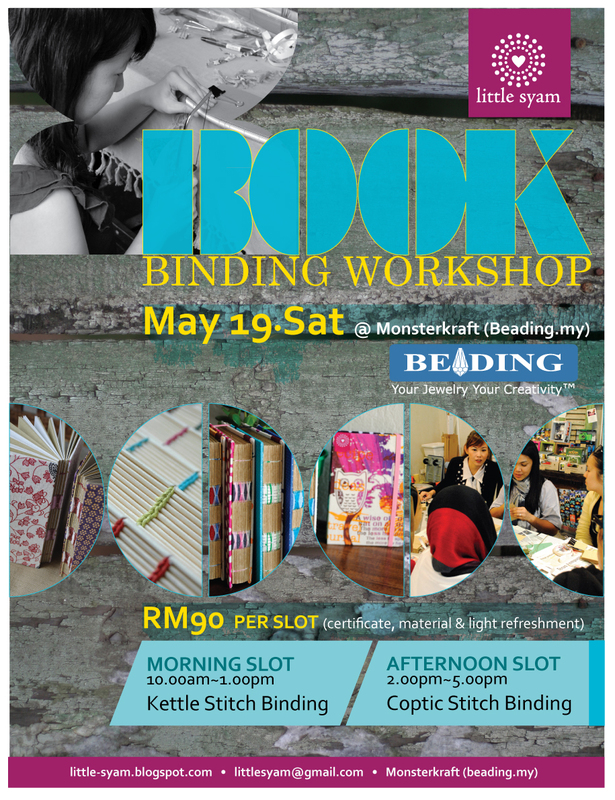 WORKSHOP 17: Small book binding workshop at Pandan Jaya for a small group // Tuesday 24 April. This weekday workshop just for a small group only. (Slot consider booked only upon payment of refundable RM50 deposit).